The Isolated DC Drive Package IDP100 Series of D.C. motor controls provides a full range of speed and torque control for 1/4 – 5 HP shunt wound and permanent magnet D.C. motors. Designed for quality and performance, these drives are targeted for the OEM and Panel Builder to meet their system requirements. Two units cover the full horsepower range. 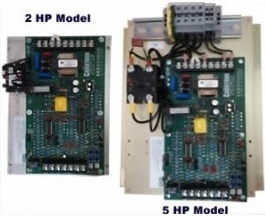 The Isolated Drive Package IDP100 Series of D.C. motor controls are also offered in models for Run-Brake and Contactor Reversing operation. Six models in two physical sizes cover a horsepower range from 1/4 to 5 HP. Each model is supplied chassis-only complete with an IDP102 or IDP105 motor control installed on the option chassis. In each horse-power range, the Run-Brake models are physically interchangeable with the Contactor Reversing models.